Freeware image resizer – and a great one too! Today’s digital cameras produce high-quality photos to be sure. But these high-resolution images can be 5, 10, 15, or even 20 MB in size. This is great if you’re planning on printing your photos – but not so great if you want to email them or upload them to a photo gallery or blog. Shrink Pic automatically resizes your images and reduces those huge multi-megabyte files to less than a megabyte (depending on the size of the original image) without reducing the quality of the photo. 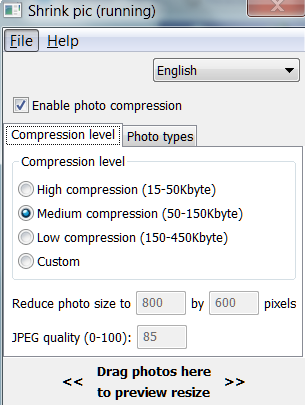 Shrink Pic reads PNG, GIF, JPEG, BMP, and TIF images -and converts them (if you choose) to JPEG format automatically. Here’s how it works: When Shrink Pic determines you are going to send an image by email, or upload an image to a web gallery, blog, or social networking site like Facebook or NotOverTheHill, it intercepts the image and automatically resizes it according to your pre-set specifications. It does everything automatically so you don’t have to open your image editor and fumble around trying to resize your photos every time you email or upload one. Best of all, the image quality is superb – so it still looks great even when it’s compressed. You can also automatically resize photos by dragging and dropping photos onto Shrink Pics’ window. You can resize dozens of photos in a very short time. If you email or upload your digital photos often, you’ll find Shrink Pic very useful. And while the developer’s Web site does not mention Windows 7 specifically, Shrink Pic worked perfectly on our Windows 7 32bit and 64 bit computers. Shrink Pic is 100%. It’s a 1.1 megabyte download. When you install it, you’ll have the option of viewing a 2 minute tutorial showing you how to use it. We suggest you watch the tutorial because it’s a good one and very short. Shrink Pic runs in the background. It has a taskbar icon which tells you it’s waiting for photos to be sent. Then, when it detects that you’re sending a large photo, it automatically creates a temporary copy, resizes it and sends it instead. It gives you a notice message, so you’ll know the photo you sent was resized. Of course, the original photo doesn’t change, only the temporary copy. If you’re using Outlook Express or Windows Mail and you use the auto-resizing in those programs, you’ll find Shrink Pic gives you much more control over the resizing of images – and much better quality too. ShrinkPic is freeware. You can download Shrink Pic from the developer’s site at http://www.onthegosoft.com/shrink_pic.htm . ShrinkPic works in 32bit and 64bit versions of Windows XP, Windows Vista, and Windows 7.